I was commissioned to make a cover for the top of a piano to coordinate with a painting hanging next to the piano. 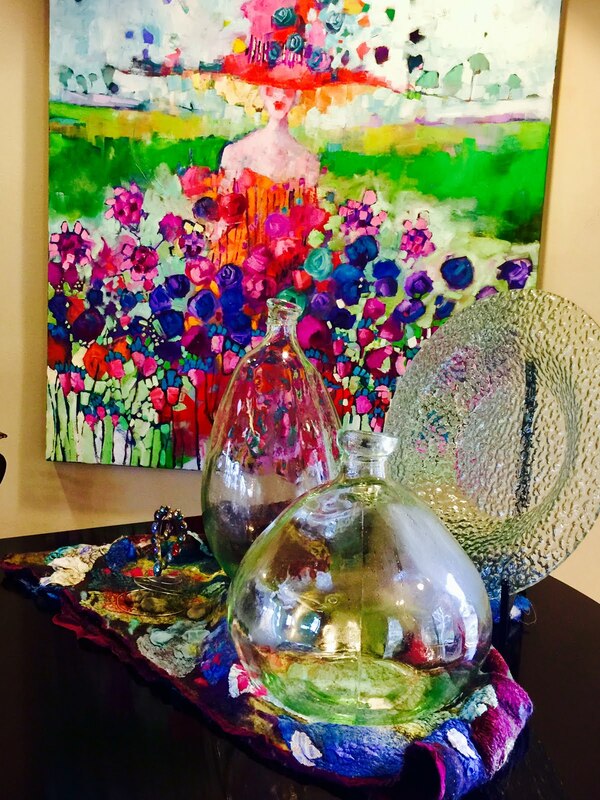 The magical, abstract impressionistic painting with vivid colors of greens, oranges and purples of a woman wearing a hat standing in a field of flowers sets the mood for the small, intimate music room. My goal was to make the felted piece have the same feeling as the painting by creating organic, textural, abstract flowers. This is the painting in the room. One of my ponchos currently sits on the top of the piano. 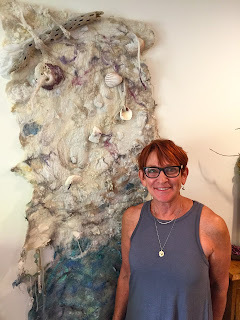 I was commissioned to make a larger felted piece to coordinate with the painting. Although the felted piece was made to be a piano cover, it also makes a terrific shawl worn right side out or inside out. There is no right or wrong way. I began by dyeing white silk fabric and white wool roving to coordinate with the colors in the painting. Click here to see how I did the dyeing. Wool roving is carefully added to the acid dye. Acid dyes were created by mixing various Dharma colors togerther. Once the silk fabrics and wool rovings were dyed and dried, I compiled them along with other fabrics and textiles that I planned to use on the piece. Before I started my design layout, I first created pre-felts with silk fabrics and one layer of wool roving. I rolled it about 200 times until it was substantial enough to pick up but not completely felted. I later cut these prefelts into various shapes and placed them on both silk fabric and wool roving. They will adhere to silk fabric since they are backed with wool roving. I laid silk fabrics for the reverse side of the piece. I added one thin layer of roving using both white and dyed roving. Here's the work in progress layout on my felting table. Staring size was 444" x 92". Work in progress showing prefelts cut into abstract flower shapes. To the bottom layer of silk fabric and wool roving, I created my design by cutting the prefelts into various shapes. 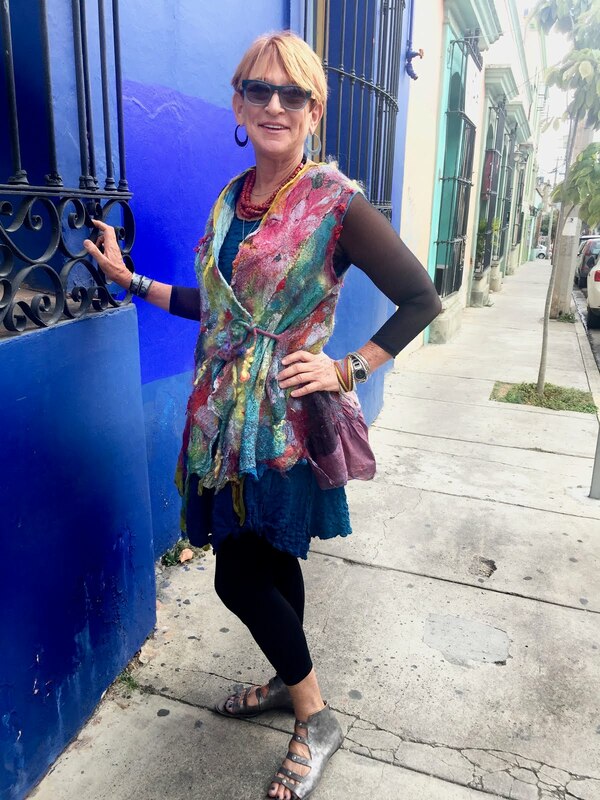 I added layers of fabrics, new and repurposed textiles including vintage sari silks, and wool roving to create my desired design which starts off as an rectangle. The felted piece shrunk about 35% overall ending up at about 31" x 53". The drape is amazing and it looks terrific as a couch cover. 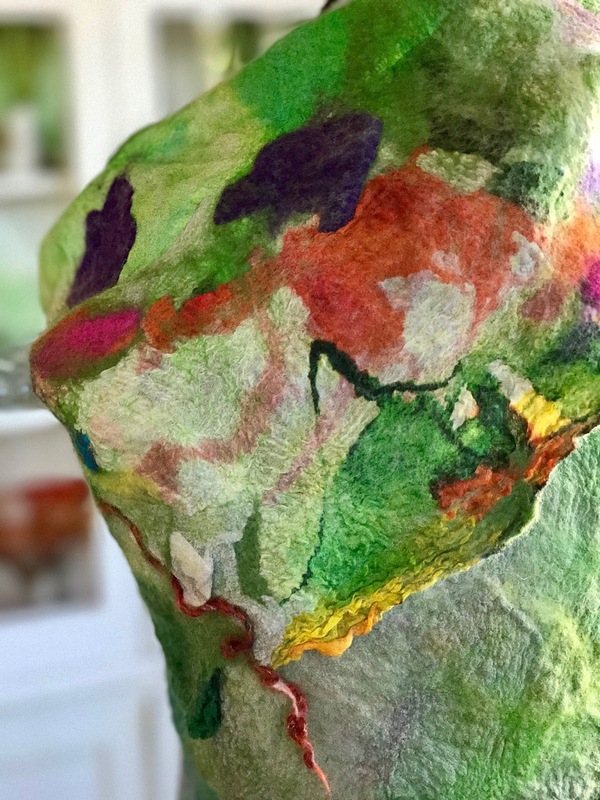 I think my felted piece captures the essence and feeling of the painting. It can be worn as a shawl inside out or right side out. Try it upside down and how about as a wrap skirt with a shawl pin. The drape is amazing. A felted piece meant as a piano cover but it can be a wearable piece of art as well as a flat piece. I did some silk and wool roving dyeing today with Dharma acid dyes in preparation for a large piece I am making for a piano cover. Some of my colors were straight from the Dharma container and some I combined by mixing several colors. I dyed pieces of silk gauze and silk chiffon the same color as hunks of wool roving. I used Ball jars and separated the silk fabric from the wool roving. I first soaked the silk fabric in a combo of vinegar and water for about 15 minutes. I did not soak the roving but added the vinegar later as explained below. I put 1 tsp of acid dye powder into a quart Ball jar and then added 16 oz of very hot tap water (I used my instant hot water faucet)using a chopstick to stir. It was really handy since the Ball jars show the measurements on the side. I then poured half of the mixture into a another Ball jar; this way I have two batches of the exact same dye, one for silk and one for roving. I then added more hot tap water filling each of the two jars almost 3/4 full. I then placed the silk fabric in one jar and the wool roving in the other. Repeat the process for as many jars as can fit into your pot. I used a big lobster pot with a inside steamer. I placed the jars into the steamer and added water to come up about 1/3 of the way around the jars. I put on the lid and let the jars steam/simmer about 20 minutes. I then added 1 T or so of vinegar to the jars with the wool roving, gently stirring with a chopstick. I then let the jars simmer another 20 minutes. After that I shut off the burner but let the pot sit until the jars were cooled...or somewhat cooled since I am always in a hurry. The water remaining the jar should be somewhat or completely clear when you remove the fabric and the roving. I rinsed the silk fabric but did not rinse the roving since I did not want to take the risk that it would felt. I drained the roving on a dish drainer in the sink and then put it in my spin dryer. I put the silk fabric in my machine dryer. Love, love these vivid colors. Wool roving on the left and matching silk fabric on the right.